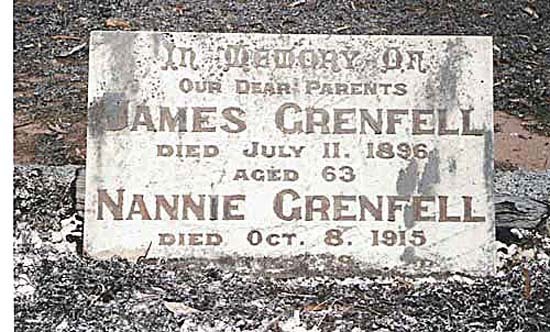 Monumental Inscriptions of Grenfell family members in Bendigo, Victoria, Australia. also her husband Henry Grenfell born Gwennap, Cornwall died 30 July 1880 aged 61 years. also his wife, Susannah Grenfell, who died 7 June 1891, aged 69 years. years, also the above Sara Grenfell died 26 November 1835, aged 85 years. 2nd stone - In loving memory of our dear mother Hilda Mary Rowe died 26 June 1959, aged 71. In loving memory of John Grenfell brother of Hilda died 6 June 1964 aged 84.